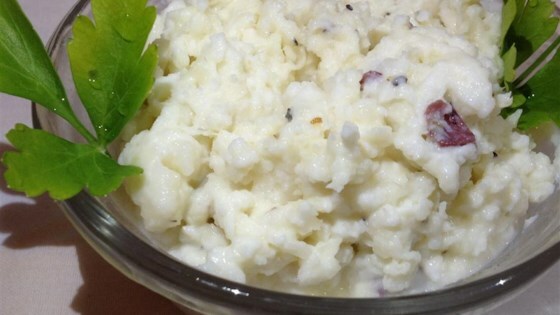 "An easy, delicious way to use celeriac or even make mashed potatoes a little more exciting. Can make a low fat version by using low fat milk and cutting back on the butter. Adapted from Bon Appetite." Place the celeriac cubes into a large pot and cover with salted water. Bring to a boil over high heat, then reduce heat to medium-low, cover, and simmer 12 minutes. Add the potatoes, and continue boiling until the vegetables are very tender, about 15 minutes more. Drain and allow to steam dry for a minute or two. Return the vegetables to the pot, and stir over medium-high heat until liquid is no longer pooling from the vegetables. Remove from the heat, and pour in the cream and butter. Mash with a potato masher until almost smooth. See how to make a quick, creamy vegetable side dish. This was great! A tip: use rice milk instead of cream (you'll never know the difference) and heat it before adding it in. It will combine better and won't drop the temperature of the potatoes! Very nice! Will definitely make again!